When Steve and I spent two weeks in Belize a couple of years ago (one week on Ambergris Caye scuba diving and the next week at Crystal Paradise Resort in the Cayo district outside San Ignacios), we spent a day at Mountain Pine Ridge. Eric Tut, our guide, drove us and another couple for about 40 minutes on a gravel road up to the reserve where we were surrounded by pine trees. I hardly knew I was in a tropic jungle anymore. 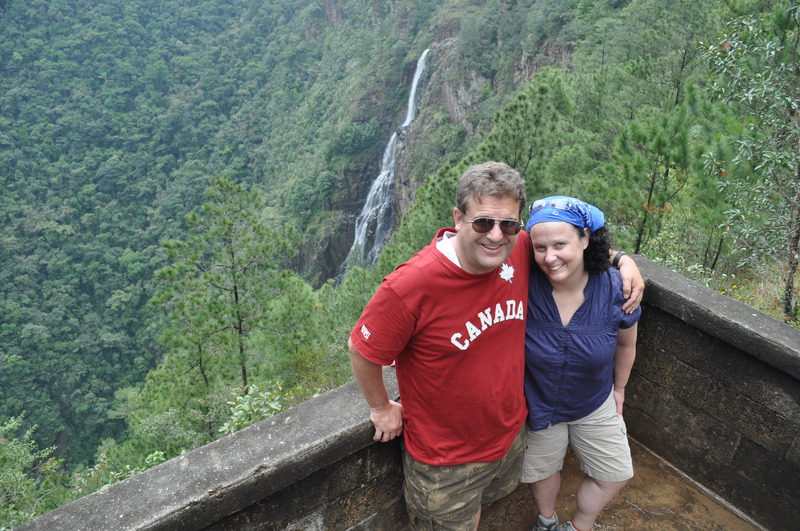 It was a bit of a quiet morning, and we were also in a prime location to see the 1000-foot falls. 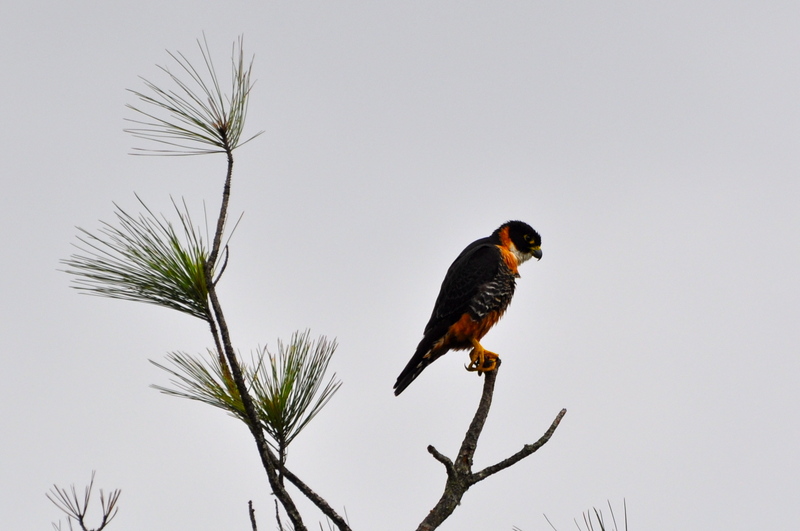 While looking out at the 1000 Foot Falls, we also got this awesome view of the Orange-breasted Falcon. While a “quiet” morning we did see a variety of birds. Of course, once it hits around noon or so it got really quiet. And hot. So Eric took us to the Rio On Pools for a dip in the pools. I love this kind of birding–bird in the morning and then go for a dip afterward to cool off. (Remember: Always bring a bathing suit on birding adventures.) On the way back to Crystal Paradise, we stopped at a little store for ice cream cups. The ice cream is made by local Mennonites and I have to tell you, it is some of the best ice cream I’ve ever had. Good thing they have this sign! So on our list of places… ! Thanks for the post. You must check out Crystal Paradise. It was the perfect place to stay and we had a bird guide the entire week we were there. We even went to Tikal, Guatemala for an overnight stay and they drove us to the border and had a man waiting for us at the border who took us to Tikal. Amazing way to arrange it. We’re heading to Panama shortly. 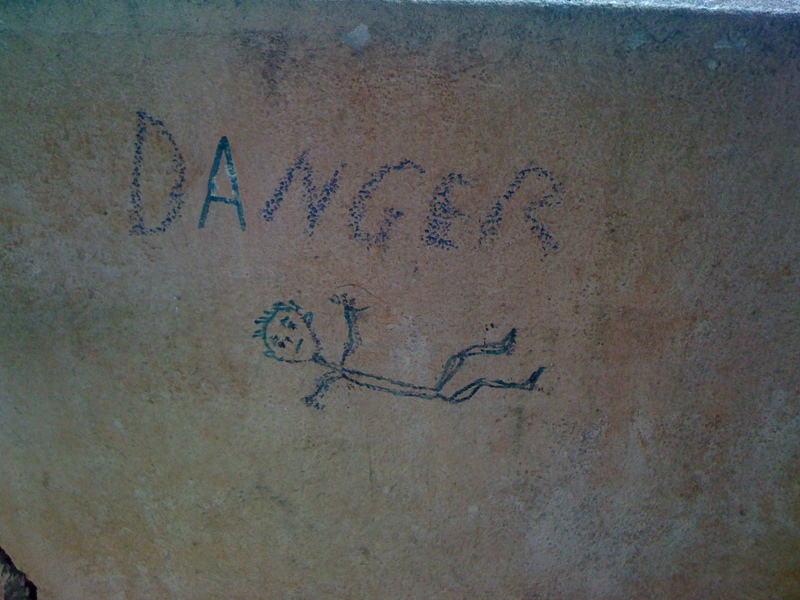 If you subscribe to this blog, you’ll get my on-the-road trip reports. Thanks so much for the information. You just put an idea in our heads… We need a big world map on which we can put pins and post-it notes. Anyway, we love looking at birds, Belize (and Central America) has long been on our short list… Sounds like we really need to get down there! You sound like my husband and me. We made a big bucket list of places to visit in the world and I’m afraid we won’t be able to get to all of them before we die. (Not that that’s anytime soon.) This year we had to choose between Thailand and Panama. Panama won. Would love to do nothing but travel, but haven’t figured out how to do that and have money magically appear in our bank account. The best “trick” I learned when I was in Belize was to shoot lots and lots of pictures. In fact, our guide, Eric kept telling me to shoot more and shoot often. Many, many clicks, in fact. By the end of the week I was shooting tons and I walked away with much better photos at the end of my trip than I did at the beginning where I seemed to be more conservative. The more you shoot the more you end up with great photos. The other “trick” is patience. I have no advice on warblers and hummingbirds, though. Those guys are so difficult for me to shoot–they flit around way too much and when you have a big lens, even harder to keep track of. I’m still learning to use my own DSLR. I’m rather new at this. Ecuador sounds like so much fun! I have trouble focusing on birds in flight though so that is my next skill to conquer. It sounds like you are still trying to figure that one out as well. I’m also a big believer on taking way too many pictures just to get one I like. 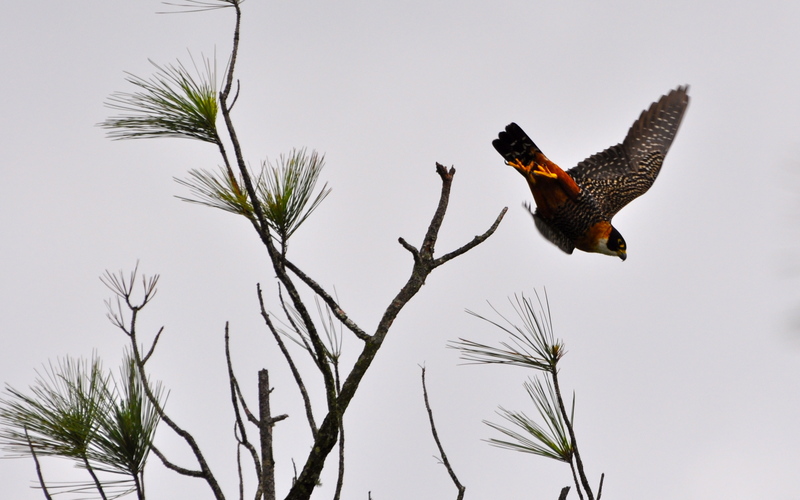 With birds that are in trees, I will auto focus then switch to manual to get the focus off the trees and on the bird. I also set my camera on burst mode to take a lot of pictures really fast just to get one or two that I really like. I only use class 10 cards and keep a spare battery charged whenever I go out. Don’t know how the battery situation will work in the rainforest though! I did buy some desiccant packs to keep the moisture to a minimum hoping that will help. We are going to visit the Sacha Lodge just outside of Quito (actually a 20 minute plane ride over the Andes followed by a 2 hour canoe ride from Quito.) I still have 6 weeks to practice with my camera before we leave.